IP Rating consists of the letters IP followed by two digits and an optional letter. The digits indicate conformity with the conditions summarized in the tables below. Where there is no protection rating with regard to one of the criteria, the digit is replaced with the letter X. For example, Motorola Moto G (3rd gen) is rated as IPX7. The first digit prefixed after the letters IP indicates solid particle protection that the phone’s enclosure provides against access to hazardous substances and the ingress of solid foreign objects. Whereas the second digit prefixed after the letters IP indicates Liquid ingress protection that the phone’s enclosure provides against harmful ingress of water. 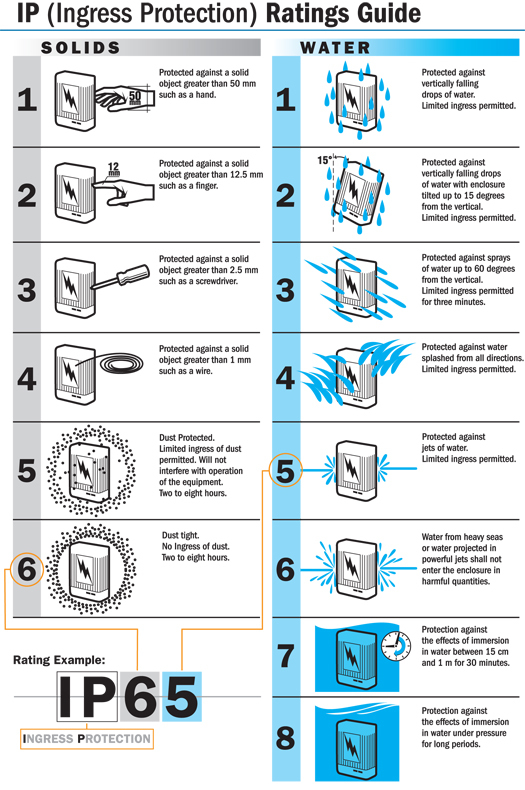 The table below shows the protection, its effectiveness for varying levels of solid and water ingress. When we put this information together we will be able to arrive at the level of protection for a mobile phone. For example, Motorola Moto G (3rd gen) which is IPX7, there is “No protection against contact and ingress of objects” and has a water of “Immersion, up to 1 m depth”. Currently, there are about 128 phones running Android and iOS that provide varying levels of protection based on IP ratings. At present, the widely available and highest level of IP rated protection for mobile phones is IP68. There are around 62 mobile phones which are rated IP68. Sony leads in the number of phones that are rated IP68 (30+ phones) closely followed Samsung( 10+ phones). The highest rated IP protection, IP69k is available for Android mobile phones manufactured by Sonim Technologies. Sonim Technologies specializes in manufacturing Ultra-rugged Android devices for various industries like defense, construction, manufacturing, oil and gas, public safety etc. With more and more mobile phones supporting various levels of protection, in future, we should see IP rated as standard part of a mobile phone configuration.